The Incas called Quinoa the "mother of all grains", I like to think of it as the "guardian of my lunch" providing me with a balanced diet to stave off cravings in the afternoon. Serve in lettuce cups, or over spinach leaves with whole wheat pita wedges. In small sauce pan combine quinoa and water, and bring to a boil over medium heat. Once boiling reduce heat to low, cover and cook for 15 minutes, or until liquid is absorbed. Allow quinoa to cool down to room temperature. 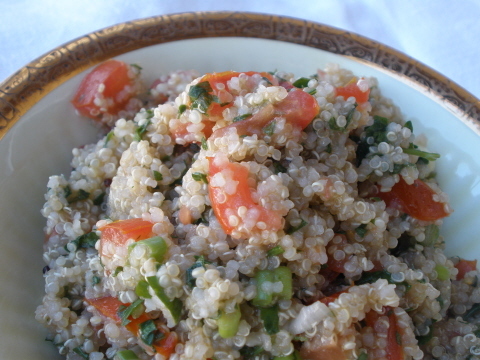 In a small mixing bowl combine cooked quinoa, parsley, tomato, onions, lemon juice, extra-virgin olive oil, balsamic, garlic, and salt. Once combined refrigerate in an air tight container for at least 30 minutes to combine flavors.